dbnAudile’s project manager was Nigel Walker, and they were working for UK based Stage One Creative Services, with whom Walker has enjoyed a long and successful working relationship. 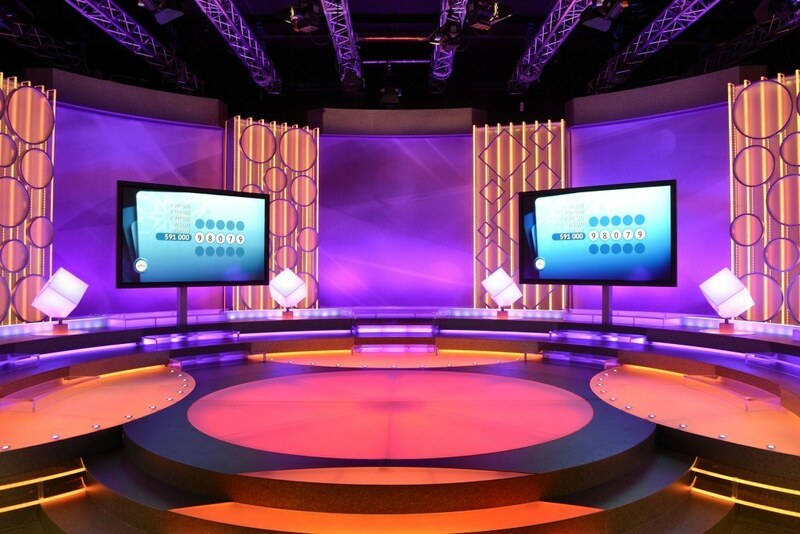 Stage One in turn was commissioned by producers Fabelactiv, to deliver a set for the high profile show which is broadcast from their HD studios in Hamer via national TV channel, NRK. Stage One appointed Nick King to design the spectacular set, and then asked dbnAudile to interpret the prominent lighting elements of the resulting 15 metre wide scenic environment, a streamlined fusion of interlocking curves made from frosted acrylic material and backlit with LEDs, embracing retro and futuristic in the same breath. The relatively short lead time was a major challenge for dbnAudile, who energised their suppliers – including Artistic Licence, Anytronics and Studio Due – all of whom rose to the occasion to deliver the orders quickly and efficiently. 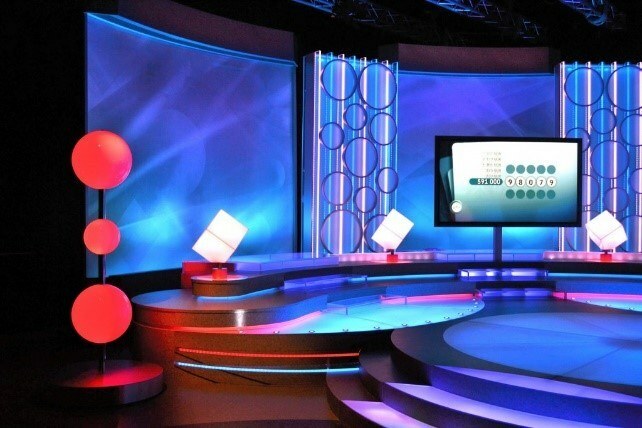 dbnAudile chose Kypai’s ColourScene RGBA LED battens, supplied by Studio Due, to illuminate the five cyclorama panels and the 4 revolving acrylic monoliths that sit between them – the CS2s were picked for their robust build, low profile and cost-effectiveness. Over 50 of these in 1200 mm and 600 lengths are ensconced behind groundrows and inside the monoliths. Underneath other areas of the floor, dbnAudile spec’d 27 Anytronics Anycolour 4-channel RGBY colour changing fluorescent batten fittings which up-light through the opaque floor tops and look smooth, even and vibrant on the overhead camera shots. These units utilise high efficiency recyclable fluorescent lightsources (energy group A) with digitally controlled high frequency ballasts for a long lifetime. dbnAudile also built a quantity of other specially tailored fittings using the RGB tri-linker modules previously mentioned. 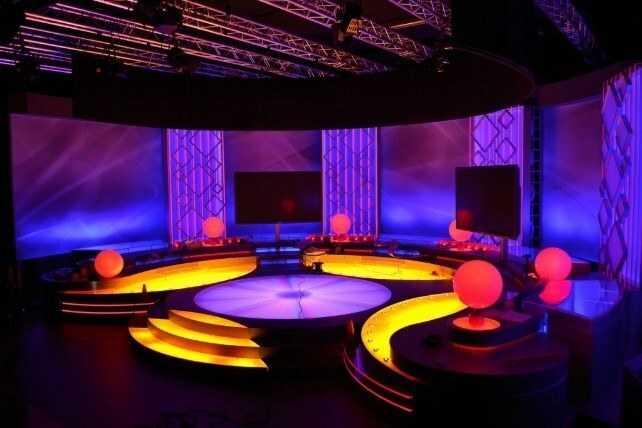 The DMX control racks were all designed and built at dbnAudile’s facility in Manchester and some of the LED lighting was pre-installed in the set pieces at Stage One’s HQ in York before being shipped out to Norway, where the build was completed and all the lighting commissioned and programmed. Walker and the dbnAudile crew worked on site with a team of seven set assemblers from Stage One led by Account Manager Simon Wood and Project Manager Rob Green, taking six days to complete the task.